We welcome you to come and take a look at our website, where you will find informative information about all our services, the materials we use, completed projects and educational techniques. Contact us to find out more about how we can help you meet all your advertising goals by using one or more of our services. Signs are the most direct form of visual communication. 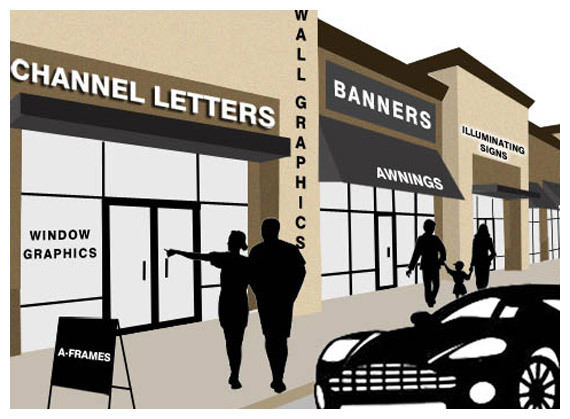 Signage perform three major communication functions for your business, they give information and direction, provide format for street advertising, and build your image. Signs convey messages to potential customers while also creating a mood. Let us take care of all your advertising needs. Looking for specific information on a product we offer. Check out our interactive map below. Highlight your preference and click. Here at BOLT Signs, we have the capability and the team to come up with and produce a creative, impactful campaign for you and your business. Advertise at special events, on the sides of a building or even create a moving billboard on any vehicle type. Let our innovative graphics department create your next piece of promotional advertisement and have our experienced installers install it, whether its a banner, vehicle wrap, mobile sign, a-frame, storefront signage, or a simple decal. Did you want to catch the eye of that driver passing by? Try our popular mobile signs for that quick message you would like to get to your customers...by far the most value for your advertising dollar...GUARANTEED! We want to help you in making the right design decisions to fit your advertising needs. © 2018, Bolt Signs. All Rights Reserved.